Shelter, food and water are life's most basic necessities, and things that are all too easy to take for granted. So much so that when it's time to get away from it all and disappear into the woods for a rejuvenating hike, it's easy to overlook your most basic needs. Without proper planning and packing, even a short day hike could turn into a potentially dangerous outing. So, before you brush off weekday stress and lace up your hiking boots, remember these eight hiking safety tips. Whether you're hiking for three hours or three days, you don't want to have an "uh-oh" moment on the trail, when you realize you've forgotten something important. Make a gear list before heading out to make sure you have everything you might need. The must-have list includes: water, extra water, rain gear, compass, map and extra food. 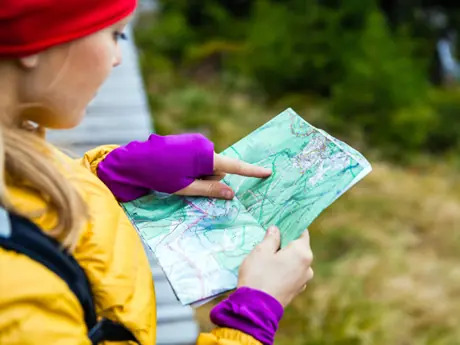 Of all the hiking safety tips, bringing a map is one of the most important. You should never rely solely on GPS technology, especially with limited service and unreliable battery power. Always pack a map, and if you're not sure how to read one, take some time to learn beforehand. Whenever possible, plan to hike during the day; not only is it easier to get lost in the dark, but the region where you're hiking may be home to a variety of wild animals that come slinking out at night. The best way to avoid being stuck out in the dark is to set a turnaround time. Regardless of how far you hike, you should stick to your predetermined time to ensure you finish hiking before the sun goes down. You can find most of this information on regional government websites, or the site for the trail/mountain itself. Jessica Sanders is the Associate Online Editor for ReserveAmerica.com. After many years of camping and hiking in the Northeast, she's exploring what the West has to offer and sharing all of her knowledge with you. She's a s'mores master, campsite connoisseur, writer, runner and lover of all things outdoors.